Illinois:	11 arrested as Quad City Die Casting workers step up fight against plant closure | Fight Back! 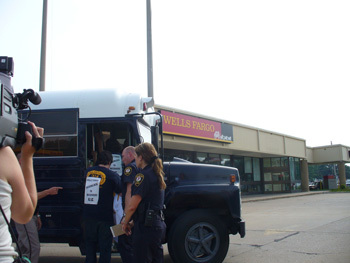 Arrested workers put on police bus after blocking road in front of Wells Fargo. 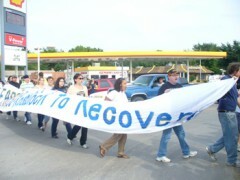 Rock Island, IL - "Wells Fargo, shame on you!" chanted the crowd of over 125 as eleven brave protesters blocked the road outside Wells Fargo here, July 9. Protesters arrived with UE Local 1174 to deliver the message that Wells Fargo bank, a $25-billion bailout recipient, has become a roadblock to recovery after cutting off credit to Quad City Die Casting, a factory of 100 workers. Lorey Butler, a machine operator at Quad City Die Casting, was one of the eleven road-blockers, all of whom were arrested and charged for their act of civil disobedience. Upon returning from arrest, Butler said, "I'm glad I did this. We're not gonna give up what we deserve." People from around the Midwest came to the scene to show solidarity with the UE Local 1174 workers, including members of the Minnesota Coalition for a People’s Bailout, Milwaukee Students for a Democratic Society and Chicago trade unionists.